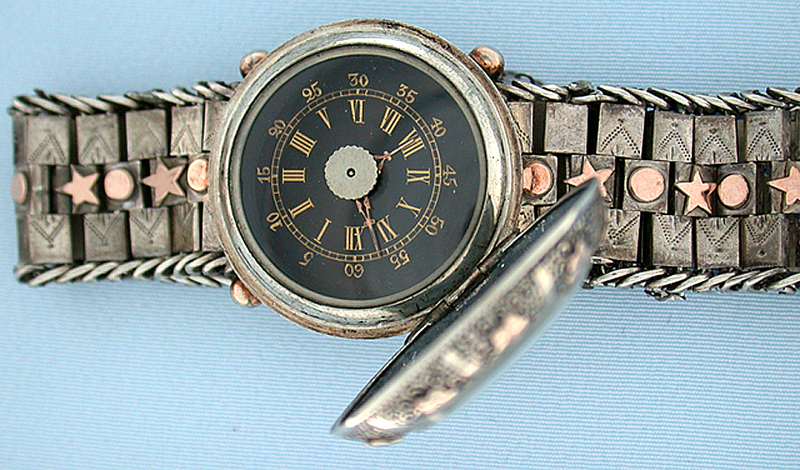 Rare and unusual early silver and gold bezel wind wrist watch circa 1890 Fancy bezel (with crystal) and bracelet, both with applied gold decoration. The bezel (with the dial) is rotated to wind the watch. Inner crystal with setting knob. Black dial with gold markings and fancy gold hands. 10 jewel cylinder movement. Overall length 6 & 5/8 inches. This is a very early production wristwatch.